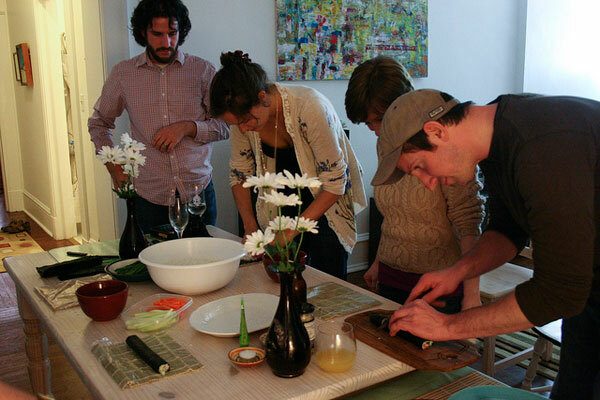 Last weekend our friends, Rachael and Casey, taught us how to make sushi at our monthly dinner club — the first interactive one to date. 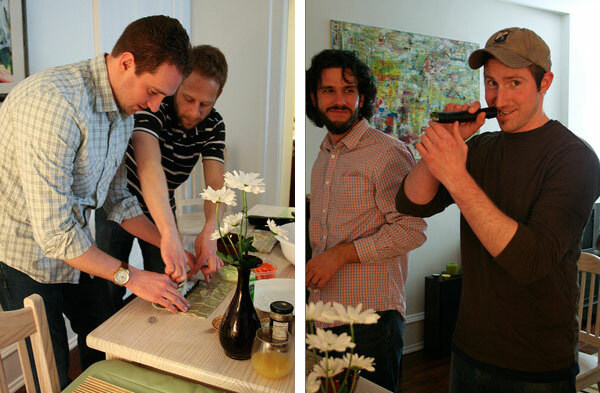 Rachael and Casey have been making sushi for years, but this was the first time both Nick and I gave it a try. Wet your hands in warm water (to prevent rice from sticking to them), and spread a thin layer of rice onto the nori (seaweed wrap). Pack the rice onto the nori. Add fillings like cucumber, asparagus, carrots, avocado, and cream cheese. (We kept the meal free of seafood due to two vegetarians and one pregnant lady.) Don’t over stuff it! Though the beginners in the group all did this at least twice. 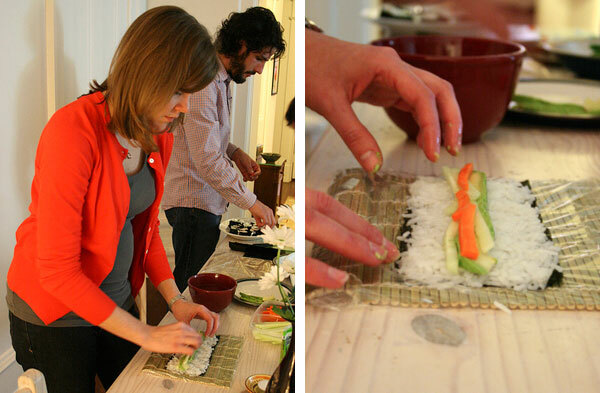 Tightly roll the sushi, using the bamboo mat (covered in plastic wrap) as your guide. 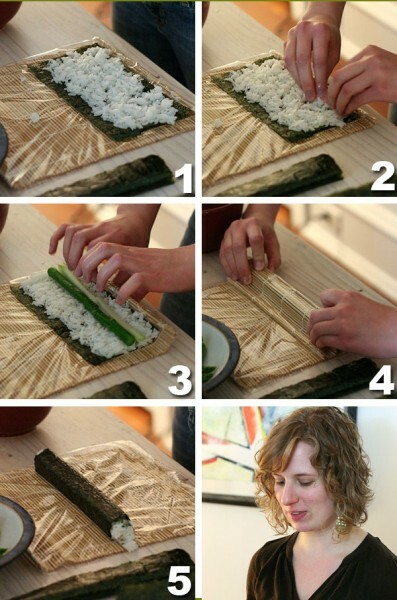 Use the mat to shape and secure the sushi roll, then slice it into bite-size pieces. She made it look so easy! The rest of us, however, struggled to keep our rolls … well, rolled. But we had a good time, regardless. And although our sushi wouldn’t earn any points for presentation, it was certainly delicious — dipped into wasabi and soy sauce, of course. 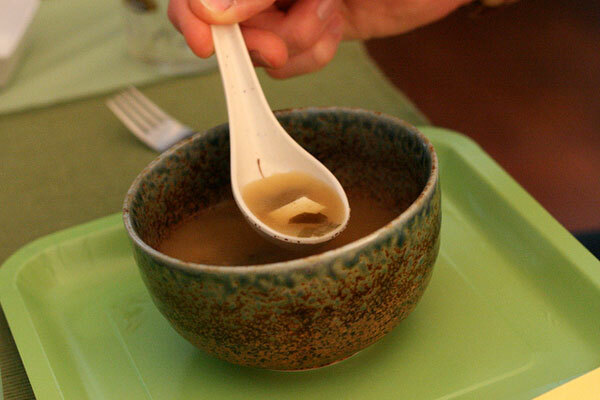 Rachael and Casey also served a mixed salad with sesame-tahini dressing and a flavorful miso soup. Japanese beer, saki, and fruit juice were on the menu, as well. Luckily our friends gave us each our own bamboo mat, so we can practice at home! 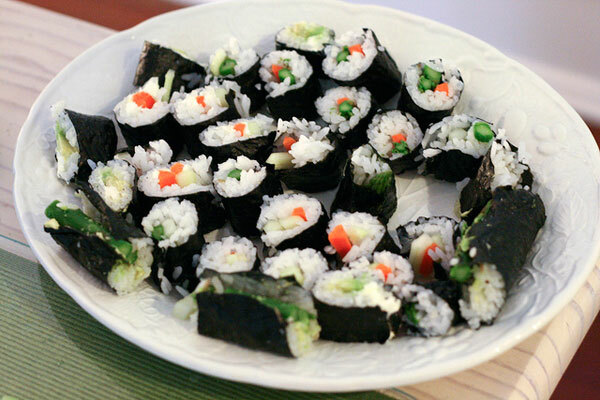 Have you ever made sushi? Rinse 2 cups of sushi rice in a strainer. Let it drain over a bowl for 1 hour. Add rice and water to a a heavy sauce pot. Bring it to a simmer, then turn the heat to low and cook, covered, for 10 minutes. After 10 minutes, turn off the heat and let rice sit, covered, for 10 more minutes. Meanwhile, mix together vinegar, sugar, and salt until fully dissolved. Pour rice onto a sheet pan. Drizzle half of seasoned vinegar over rice. Fluff rice with chopsticks or a fork while constantly fanning it out. Then drizzle remaining vinegar on top. Fluff and fan. Keep cool until ready to use. I have and I love it. We usually make it a girl’s night activity and though I am not very good at it, the results always taste great. It’s fun and you’ll get better every time you try it. Promise! 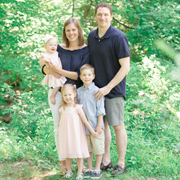 How fun to be in a monthly dinner club — I love that idea! I’ve always wanted to make sushi at home, but heard that the rice making process was a little fussy. This doesn’t seem too bad at all! Excuse me – where was my invitation? lost in the mail? I’m just teasing 🙂 I want to try making sushi SO BAD! Maybe we’ll have a sushi making party.